Tonya left Guadalajara on Wednesday and will arrived in Los Angeles where the U.S Marshals Service will take her into custody, according to Mexican authorities. Guadalajara, Jalisco, Mexico – Mexican federal authorities have confirmed that Tonya Couch, 48, has been deported to the U.S. Tonya was placed on a flight from Guadalajara to Los Angeles where the U.S. Marshals Service will take her into custody on Thursday morning. 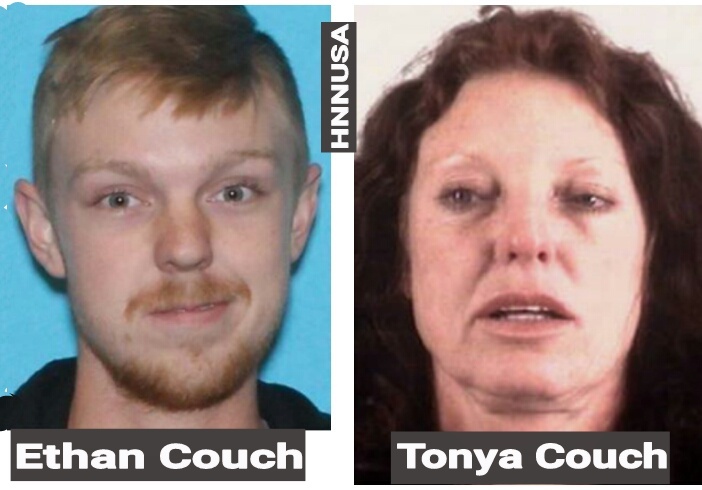 Tonya will then be taken to Texas to face one felony count for hindering apprehension of her son, Ethan A. Couch, 18, aka, “Affluenza” who was wanted in Tarrant County in Texas for violating probation. Couch was convicted two years ago for driving under the influence of alcohol and killing four people and seriously injured two other victims in a crash in Burleson, just South of Fort Worth. He was given 9 months probation. Couch and his mother went missing last month after a video surfaced showing him at a teen beer pong party. Tonya was arrested along with Couch in Puerto Vallarta after giving false statements and names, according to Mexican authorities in Jalisco. Couch is facing a petition to transfer his juvenile conviction and sentence to adult court in Tarrant County. Tonya is facing a felony charge for hindering apprehension and if convicted, she is facing from 2 to 10 years in prison. Couch’s attorney filed for a stay from a voluntary departure and will remain in Mexico for an extra three days. Both Tonya and Couch’s tourist Mexican visas expired and were being held by Mexican immigration authorities in Jalisco. The U.S. will seek an extradition request for Couch, if he refuses to return to Texas. Cosby was charged with one felony count for sexual assault. St. Norristown, Pennsylvania – On Wednesday, Bill Cosby, 78, was charged with one felony count for sexual assault (aggravated indecent assault) and bail was set at $1M in Montgomery County in Pennsylvania. Cosby posted $100K cash and is free on bond. If convicted, Cosby is facing up to 10 years in prison. The criminal complaint states that Cosby drugged and sexually molested Andrea Constand in 2004 at her home and even penetrated her without consent. A preliminary hearing for Cosby is set for January 14. Cosby has not entered a plea yet in the case. Constand’s sexual assault criminal case is the first to be filed after 50 White women have alleged that Cosby had drugged them and sexually assaulted them in the past. 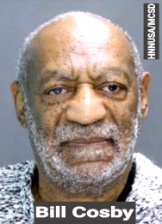 Cosby, a well known Afro-American comedian who has denied the allegations. Licenses and ID”s from nine states, U.S. territories and Common Wealth will no longer be valid in 2016 to enter federal buildings or board commercial flights. Washington D.C. – On Jan. 10, 2016, licenses or ID’s from the following states, territories and Common Wealth including AK, CA, IL, NJ, WA, MO, MN, NM, SC, Puerto Rico, Guam and U.S. Virgin Islands will no longer be valid under the 2005 Real ID Act, according to TSA. People with these types of identification or licenses will no longer be valid to enter federal buildings or board commercial flights within the U.S.
U.S. 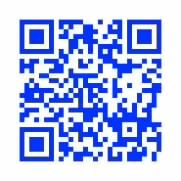 Passports valid as an alternative to enter federal buildings and board commercial flights. Couch had vanished and violated probation conditions after being convicted of drunk driving and killing four victims in a crash. 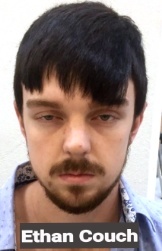 Puerto Vallarta, Jalisco, Mexico – Mexican federal authorities have confirmed that Ethan Anthony Couch, 18, aka, “Affluenza” who was wanted in Tarrant County in Texas for violating probation has been taken into custody. Couch was convicted two years ago for driving under the influence of alcohol and killing four people and seriously injured two other victims in a crash in Burleson, just South of Fort Worth. Couch went missing last month after a video surfaced showing him at a teen beer pong party. The U.S. 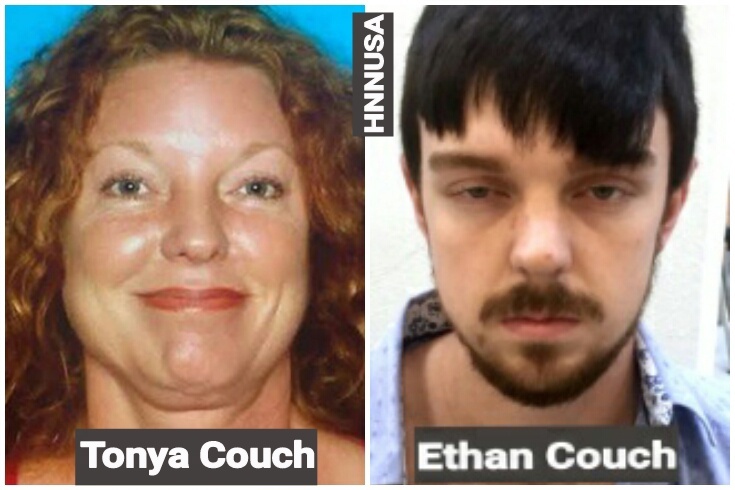 Marshal Service and the FBI searched for Couch and his mother, Tonya Couch, 48, who also went missing. She was arrested along with Couch in Puerto Vallarta after giving false statements and names, according to Mexican authorities in Jalisco. Tonya had voluntarily decided to leave Mexico by Wednesday and return to Texas, but her attorney filed for a stay in the voluntary departure and will remain in Mexico with Couch for an extra three days. Their tourist Mexican visas had expired and are being held by Mexican immigration authorities in Jalisco. The U.S. will seek an extradition request for both Tonya and her son, if they refuse to return to Texas. Tonya could attempt to bribe Mexican immigration authorities to grant her and her son asylum until he turns 19, so he will no longer be held accountable for his conviction as a juvenile for driving under the influence of alcohol causing the death of four victims in 2013. 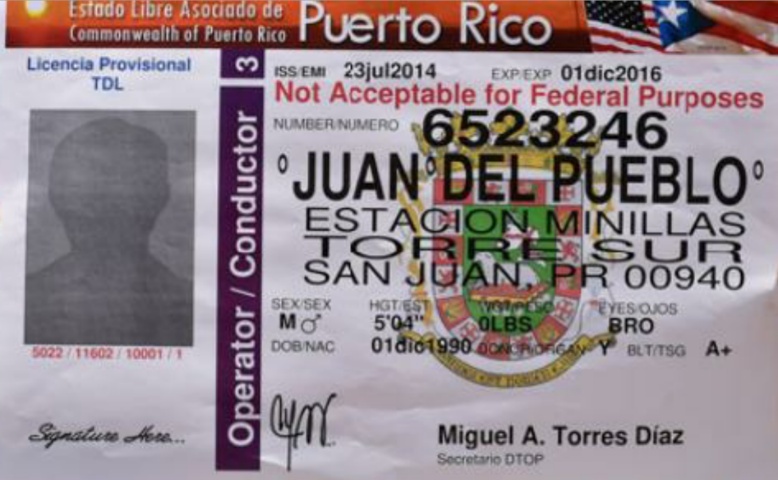 A Puerto Rico police officer has been taken into custody after killing three supervisors in Ponce. Ponce, Puerto Rico – On Monday, three Puerto Rico Police Supervisors, Commander Frank Román Rodriguez, 49; 1st Lieutenant Luz M. Soto Segarra, 49, and Officer Rosario Hernández de Hoyos, 42, were fatally shot by Police Officer Guarionex Candelaria Rivera, 50, according to Puerto Rico Police in Ponce. Rivera went to the police station in Ponce where he was assigned and took both Segarra and De Hoyos hostage after a work related dispute just after 9:00 a.m. Segarra was Rivera’s immediate supervisor. Rivera was severely shot at least three to four times and was transported to the Rio Piedras Medical Center. The hostage and deadly turn of events at the Ponce Puerto Rico Police Station continue to unfold as crime scene investigators search for a motive. Several weapons including Rivera’s police department handgun were recovered at the crime scene. Rodriguez had 28 years of service in the Puerto Rico Police, Segarra had 23 years of service and De Hoyos had 15 years of service. Rivera has 19 years of service with the Puerto Rico Police. Captain Wurth advocates to achieve trust, a community partnership with police and making the Milwaukee 2nd Police District Station a safe place in the Southside for the community it serves and protects. Milwaukee, WI – On Monday, Captain Heather N. Wurth confirmed that she will continue to make the Milwaukee 2nd Police District Station a safe place for community members to visit or seek services from the Milwaukee Police Department (MPD). 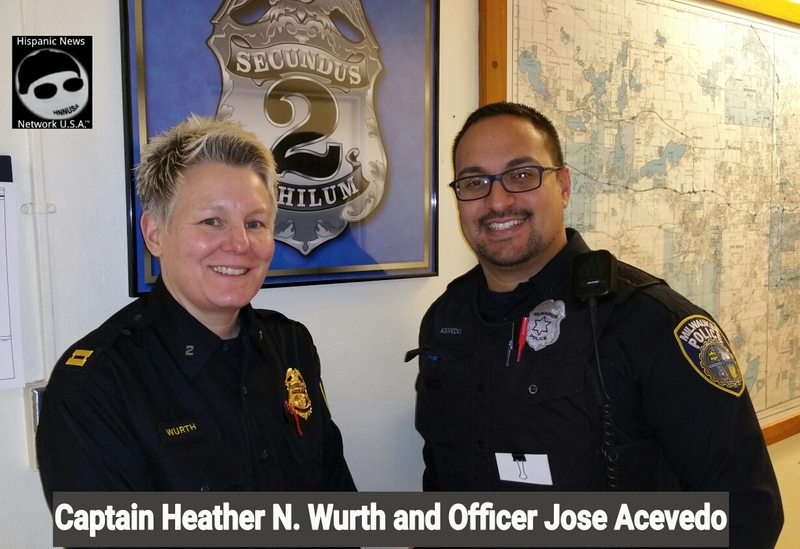 Wurth was promoted to Captain by MPD Chief of Police Edward Flynn in November and has been working with Hispanic and non-Hispanic officers to learn about the Southside community she now serves and protects. 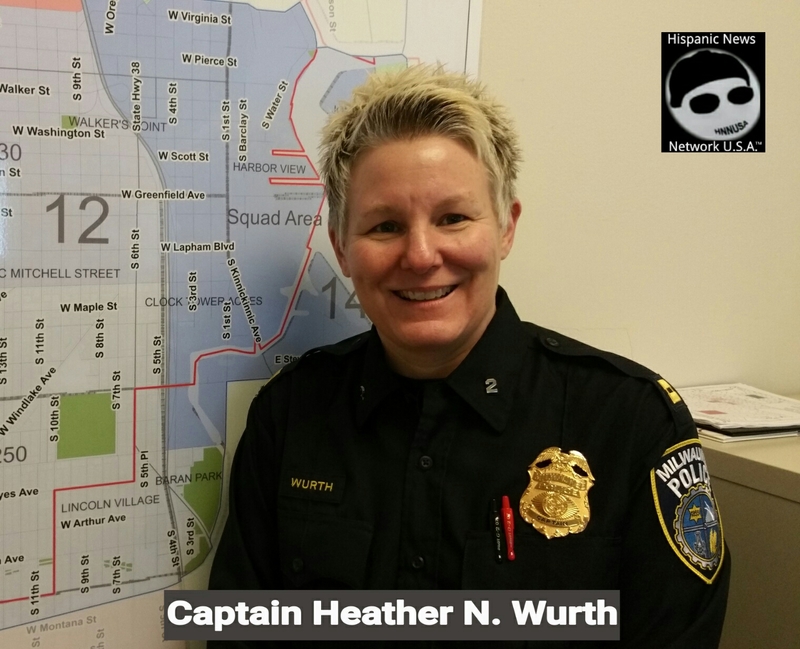 Captain Wurth says, that she has an open mind and in the short time she has been in the 2nd Police District, Wurth has noticed how diverse the community is in the Southside compared to other districts she has worked. She is looking forward “to learning more about the district itself, the culture, history and diversity, but also learning about the stake holders, community organizations and faith based organizations really engaged in their own neighborhoods assisting the police with our enforcement activities.” She has met with community based organization leaders and Business Improvement District (BID) members in the area in the short time that she has been at the 2nd Police District Station. Captain Wurth wants for the community in the 2nd Police District to continue to trust and work with police officers in the area as a partnership to help prevent and solve crimes. She acknowledged a number of challenges in the district and looks forward in meeting those challenges with a partnership between the community and police. Currently, Captain Wurth has assigned police officers with squads including to walking beats to patrol W. Lincoln Ave., W. Greenfield Ave., W. National Ave. and the Walker’s Point area. Captain Wurth says that district two has dedicated police officers including Spanish Speaking officers and a Milwaukee County Community Prosecution Unit (CPU) that works in partnership with the community. Two of the Community Liaison Police Officers at district two are Jose Acevedo and Jesús Gloria. Captain Wurth confirmed that she will be attending both the Spanish and English language community crime analysis meetings in the Southside, so that she can meet community members residing in the area. Captain Wurth has an impressive career with MPD, she has been with the Milwaukee Police Department for 23 years and have worked a variety of assignments, both patrol and administrative. Captain Wurth previously worked at District 3, District 4, District 5, District 7, the Warrant Squad (now known as the Fugitive Apprehension Unit), the Vice Squad, and Internal Affairs. “During my patrol assignments, I have been enthusiastically involved in activities designed to build community relationships and believe this to be integral to the success of the Department and its officers, as well as the strengthening of our neighborhoods. I have also been committed, through my administrative assignments at the Internal Affairs Division and as an adjunct instructor, to the partnerships between professionalism and advanced training,” Captain Wurth stated. Captain Wurth has a Master’s Degree in Administration of Justice from Marquette University and is a graduate of the Federal Bureau of Investigation National Academy Session # 249. The home owner released a photo of a 13-year-old suspect who broke into her Austin area home and burglarized it. Austin, Texas – A 13-year-old boy and his 15-year-old sister have been taken into custody after allegedly breaking into a home to burglarized it in the Austin area. The male suspect was caught by a surveillance video camera inside the home on December 11. 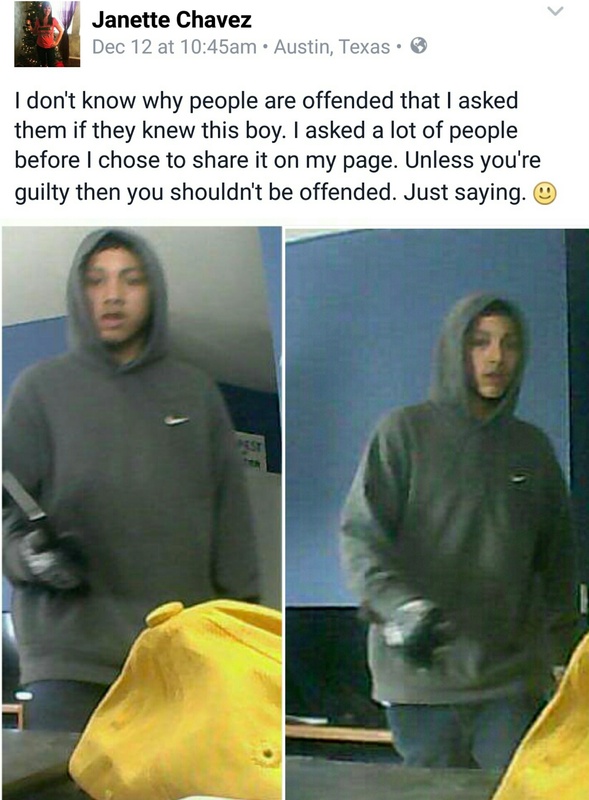 The home owner, Janette Chavez posted the burglary suspect’s photo on her Facebook account. According to Chavez, the teen male suspect also dropped his cellphone in her backyard and neighbors saw him in the vecinity too. She turned the cellphone to the Travis County Sheriff’s Office. The two siblings are facing burglary charges.